A two bedroom upper ground floor flat with good natural light and ceiling height, within this imposing Victorian building. The flat, which has been redecorated throughout has a separate modern kitchen and a reception at the back with pleasant aspect over extensive gardens. 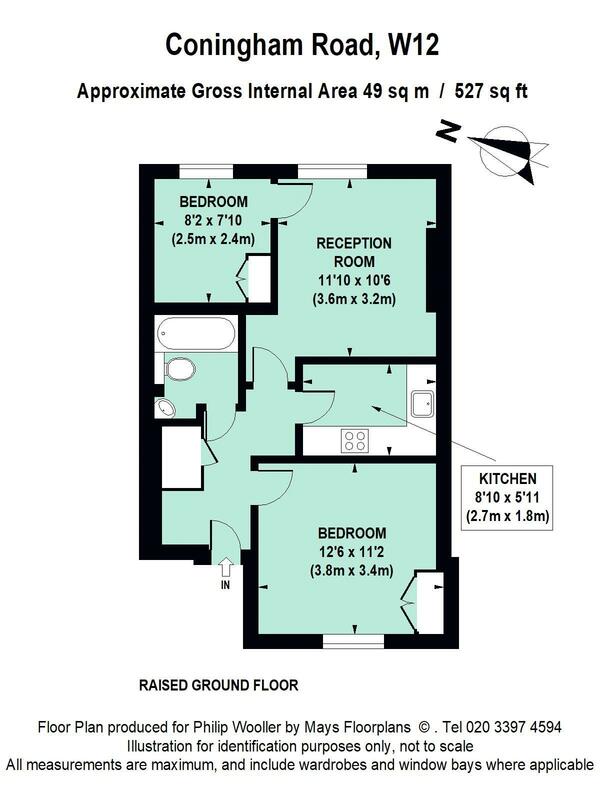 There is a small second bedroom or study ( also at the back ) and the flat offers a good amount of storage. Coningham Road runs between Goldhawk and Uxbridge Road and the flat is located in the wider tree lined section of the street north of the junction with Findon Road. Ravenscourt Park is within a short walk, as is Wendell Park, numerous good schools and the shopping and transports hubs of Hammersmith and Westfield. East-West bus routes, Shepherd's Bush Market tube and Uxbridge Road's eclectic mix of shops, restaurants and theatres are all within a few minutes walk. 527 sq ft / 49 sq m approx.